This won’t come as much of a shock to you all when I tell you how much I love Christmas. For me Christmas isn’t just about one day of the year, it lasts and an entire season. From hiding away those end of summer sale bargains that I know the kids will love. To writing up a list of whom to buy for, before flicking through the various gift guides deciding what to treat them to this year. To my favourite part of Christmas, the decorations. You can’t have Christmas without decorations or have too many decorations in my opinion either. With Roo and Tigger’s birthdays out-of-the-way, I am in full-on Christmas mode (although Piglet’s birthday is at the end of the month). This year I’ve tried to be organised and have purchased 98% of the presents I needed to buy. From texting family and friends around a month ago asking for their wish lists Mr. Boo and I completed a big shop at Lakeside during the half term holidays. I’m not, however, quite so organised when it comes to my own Christmas wish list. Pyjamas, obviously, always feature on their but I don’t really know what else I want or need. I quite like the idea of an afternoon tea in a posh hotel, or maybe a nice relaxing spa day would be good too. 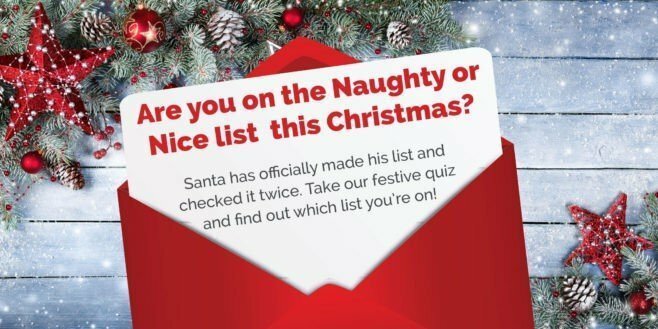 Red Letter Days have just published their flagship ‘Naughty and Nice’ quiz for Christmas, featuring 14 possible prizes over the next seven weeks, ranging from a seasonal lump of coal to a supercar driving experience and more. I’ve just completed this and I’m proud to say that I am on the ‘nice list’ (polishes halo)… Fingers crossed for you all as there are some wonderful #merrymemories prizes available.